Middle-age scare you too? I refuse to let my body fall apart! How am I going to manage that you ask? With juiced Barley Grass powder of course.Barley juice powder (such as Barleylife®), is classed as a green food concentrate and is fast becoming the supplement of choice to many health conscious people. Research has found that barley grasses are richer in vitamins and nutrients than most other raw vegetables and cereal grasses. In fact young, green barley grasses are an incredibly complete source of nutrition, containing a wide spectrum of vitamins, minerals, amino acids, proteins, enzymes, chlorophyll, and phytonutrients. "Barley Grass is one of the most incredible products of this decade. It improves stamina, sexual energy, clarity of thought, and reduces addiction to things that are bad for you. It also improves the texture of the skin and heals the dryness associated with aging." of Preventive Medicine, Washington D.C.
Studies show that young barley is at its nutritional best before the beginning of its flowering cycle, when the plant channels nutrition to the seed heads. Barley leaves harvested at this stage have a different nutritional composition to older leaves. Lets see what the benefits of barley juice are and why you should consider adding it to your diet. It also considered to be part of the powerful antioxidant foods group with anti-ageing properties because of the high levels chlorophyll and enzymes. It contains an abundance of phyto-chemicals protect against the effects of radiation, pollution and other environmental stresses to maintain the body's health. Some preliminary studies indicate that Barley juice has the ability to inhibit certain cancer cell growths, mainly breast and prostate cancer. There are testimonies of cancer patients who claim to have been healed by consuming juiced barley grasses and changing their lifestyles but further studies are needed. Patients with ulcerative colitis participated in a study. Those who were given juiced Barley grass showed significant improvements in their symptoms - including less bouts of diarrhoea and reduced pain - compared to the group of patients receiving conventional medication (standard anti-inflammatory medication including steroids). Low levels of friendly bacteria in the gut and an accumulation of toxins in the bowel are thought to contribute to Ulcerative colitis. Barley juice helps reverse this by encouraging the growth of friendly bacteria in the bowl. This helps reduce inflammation and improves symptoms of ulcerative colitis. Barley powder also helps combat ulcerative colitis by balancing the water content of the bowel content land owering the amount of inflammatory chemicals in the bowel, including one called epithelial NF-k. Barley powder is a powerful cleanser. It helps to gently detox the liver, kidney, and digestive tract. By improving digestion and the absorption of nutrients, you’ll find that you have more energy and better endurance in sporting activities. 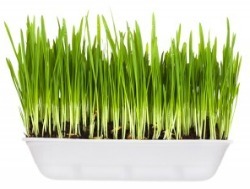 Adding Barley grass juice to their diet has benefited many people in raising their pH. When large quantities of processed foods that are eaten in the typical western diet make our bodies more acidic, this forms the perfect breeding ground for disease. Barley grass is very alkalizing and when the body has a balanced pH, the cells in the body are able to function optimally. Delivers twice the nutrients per serving than a typical serving of green vegetables. Provides anti-inflammatory benefits to maintain healthy joints and tissues. Helps maintain cardiovascular health by helping prevent blood clots. The powder form of barley juice gives you the advantage of juicing without the mess. Just add it back to water or your favourite smoothie recipe for an energising health drink. For the best quality barley powder, the young leaves should be juiced and dried as soon as possible after harvesting (within minutes) and definitely not milled as some companies do. This ensures maximum nutrition and fresh-tasting juice powder. What's Your Favourite Health Benefit or Experience With Barley Juice Powder?